A narrow area with low light provided a challenging aspect for Outside Concepts when we were asked to design and build a single carport for the owners of this home in Bayside Melbourne. Not one to be put off by a challenge, David Bunton and his team from our Bayside Branch set about the task, with some clever design and ingenuity. To overcome the space and light issues, David designed and built a simple gable roof carport for the area. This helped in two ways. Firstly, the extra height of the roof, particularly compared with a flat roof, lets much more light into the area. Just as importantly, the extra height gives the perception that the area is larger and less closed in. 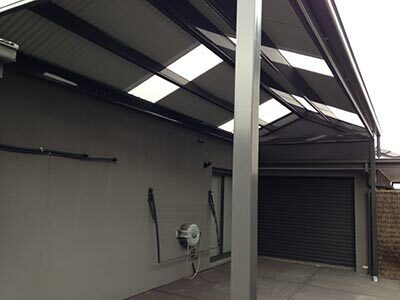 To further improve light-entry, Colorbond metal roofing was combined with polycarbonate roofing. Structurally, Firmlok beams were used to erect the carport. These structural beams are not only light but also strong and provide a solid assembly that won’t warp, twist or split. Plus there’s the added low-maintenance advantage of no painting required. The colours, style and other components used in the carport were carefully chosen to perfectly match the house. Concept to clean up. Call Outside Concepts for a free quote on 1800 601 674.